Welcome to Cars of the Ku, a sometimes weekend segment where we highlight a cool car found on the Japanese streets. 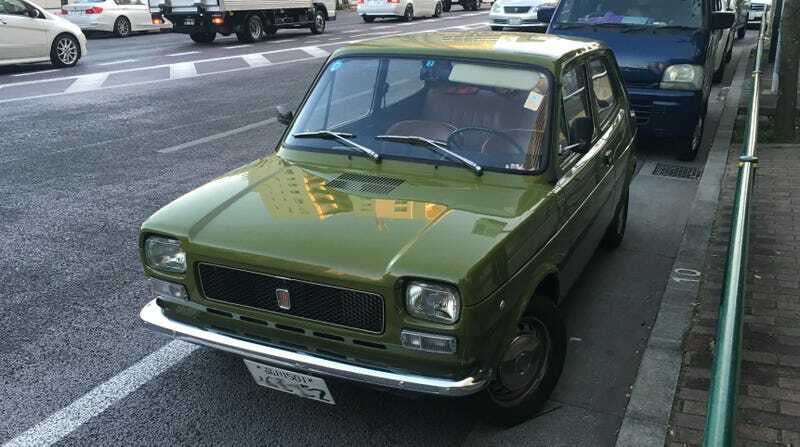 Ku (区) is the Japanese word for “city ward.” Today, we have this lovely green Fiat 127 I saw on my up-hill, both ways travails through Minato-Ku in central Tokyo. Isn’t it adorable? You just don’t see many older cars around flashy areas like Minato these days. And when you do, rarely are they this clean. Despite the slightly overcast day, the paint really gleamed and nearly all the chrome was sparkly. And the inside dash? No fading or cracking sight. Truly beautiful. The seats? Looked so supple I wanted to crawl in the back sleep on them... Not that the owner would approve. The Series I Fiat 127, produced from 1971 to 1977, was Fiat’s first foray into my favorite category: the supermini. If you’re not aware, my Honda Logo GA3 is a supermini. Originally, the Fiat 127 was sold only in this version—the two-door “saloon.” If you’ll notice, this isn’t actually a hatchback. It’s a standard trunk, but it seems like the Fiat designers figured out pretty soon that the curved rear (shush now, are you 12?) was perfect for a full hatchback design and it quickly followed the original. The Fiat 127 was an instant success, and the Renault 5, Ford Fiesta, Volkswagon Polo and GM’s Opel Kadett/Vauxhall Chevette quickly followed. Yet none of them, in my view, have the cute and quirky looks of the Fiat 127, which only took three years to reach one million sold. Clearly, a whole lot of people agree with me.